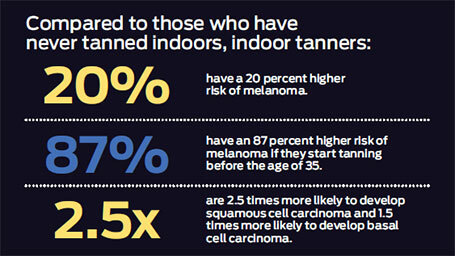 We all know that tanning beds are bad for us, but here is how bad. 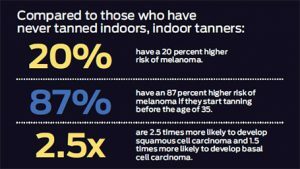 From JAMA dermatology, women under 50 who regularly tanned indoors were at a two to six fold increased risk for developing melanoma. It is concerning that such a large portion of young women follow the tanning trend and began as adolescents that the melanoma risk will be much greater in the future. Melanomas developed most often in young women on their trunk. Melanoma rate are generally higher in women than men until about age 50. In one study, nearly all women who developed melanoma were younger than 30 at diagnosis reported indoor tanning more than 10 times. As of December 2015, the FDA is proposing restricted indoor tanning for minors. However, the restriction is different in each state and almost half the states still have no restrictions.